It’s a no-brainer to pick option B, right? Well, you have to make that same decision when it comes to the fuel your body runs on, and guess what? Most people pick option A every day. The human body can choose between two different fuels: glucose (from carbs) and ketone bodies (from fat). One ketone body called BHB is the clean and effective fuel your body can use for energy, yet you probably didn’t hear about it at school… or anywhere, really. What Are BHB Salts or Exogenous BHB? Can I Take BHB Salts While Fasting? 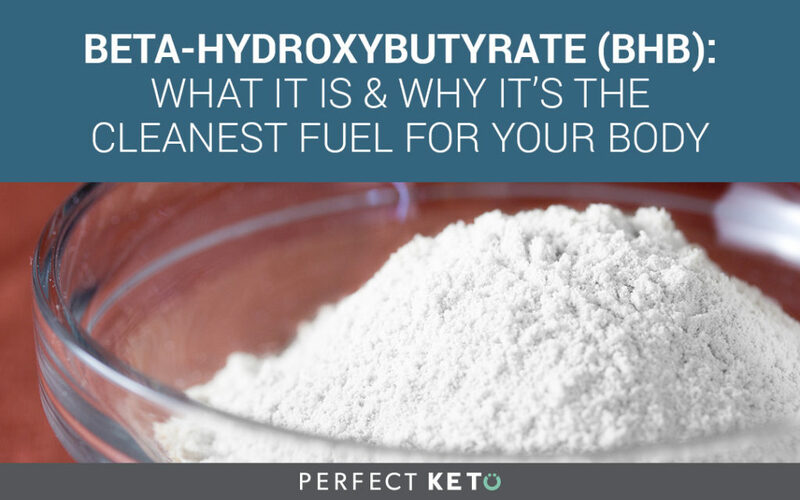 Beta-hydroxybutyrate (BHB), is one of the three ketone bodies (energy molecules) your body makes when it’s running on fat instead of carbs. It’s also known as 3-hydroxybutyric acid or 3-hydroxybutanoic acid (3HB)[*]. Beta-hydroxybutyrate (BHB). This is the most abundant, making up to 78% of total ketones in the blood[*]. Acetoacetate (AcAc). It makes up around 20% of ketones in the blood. Acetone. The least abundant, making about 2% of ketones in the blood. It’s not used for energy. Both BHB and acetone are derived from acetoacetate (AcAc), however, BHB is the main ketone used for energy because it’s extremely stable and abundant, while acetone is lost through respiration and sweat. D-BHB: This is the one your cells use for efficient energy and its produced in high amounts. It’s responsible for the anti-aging effects of total BHB. L-BHB: This one is produced in lower quantities and can’t be used for energy as efficiently as D-BHB. It’s more helpful in the synthesis of fatty acids. Ketosis is the metabolic state of using ketones — both BHB and AcAc — for energy instead of glucose. If you’re wondering — why would I need to switch fuels? The answer is simple: BHB works better. It’s not unnatural or harmful — in fact, it’s the opposite. BHB has more advantages beyond efficient energy production. It can supercharge your metabolism in ways glucose can’t. 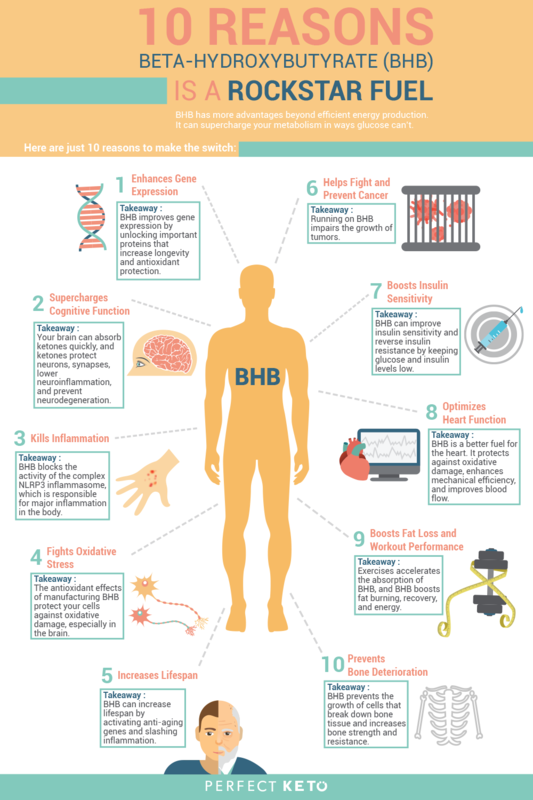 A lot of the benefits of BHB come from its ability to optimize the expression of your genes, aka the way your cells interpret DNA instructions. That’s why we’re starting with it. DNA is the biological code that specifies how organisms grow, function, and reproduce, which rarely changes. DNA expression is simply how well this code is passed down to your cells, which can vary depending on several factors. You can think of DNA as the assembly instructions for building an IKEA chair, and DNA expression how well you interpret them to actually build the chair. If DNA expression is impaired (you can’t understand the instructions), your cells can’t create the proteins they need to survive. Transcription: The DNA instructions for making a specific protein are copied into a messenger molecule called mRNA (think of printing your chair instructions). Translation: The mRNA is read and used to assemble the correct amino acids that form the protein (think of reading the instructions to assemble your chair). BHB improves gene expression by inhibiting molecules that silence important proteins[*]. It makes helpful genes available for expression, including FOXO and MTL1. The FOXO genes regulate oxidative stress resistance, metabolism, cell cycle, and apoptosis, which influences longevity and lifespan. MLT1 can help reduce toxicity[*]. Takeaway: BHB improves gene expression by unlocking important proteins that increase longevity and antioxidant protection. Ketones are able to cross the blood-brain barrier easily and provide your brain with over 70% of its energetic needs[*]. This is possible because your brain becomes extremely receptive to ketone bodies when there’s not enough glucose around. In fact, neurons consume a lot of BHB, at a rate of 0.032 mmol/kg/min[*]. Preservation of neurons and synapses — which improves memory, focus, attention, and learning. Improved cognition in people with dementia, including those with Alzheimer’s and Parkinson’s disease[*]. In one study, an increase of BHB in the brain 90 minutes after ingesting MCT oil improved paragraph recall in adults with impaired memory[*]. Preliminary studies also show ketones can improve working memory in both young and old subjects[*][*]. Another study found BHB has antidepressant and antianxiety-like effects because it prevents neuroinflammation in the hippocampus[*]. Multiple studies suggest BHB may be beneficial in preventing neurodegenerative diseases, including Huntington’s disease, Parkinson’s disease, and Alzheimer’s disease by improving mitochondrial respiration, preventing the accumulation of a toxic molecule called amyloid-β, and preventing brain atrophy[*]. BHB also protects the central nervous system by preserving an important type of cell present in the brain and spinal cord called ramified microglia, which acts as a sensor scanning for potential threats and protects neurons[*][*]. Takeaway: Your brain can absorb ketones quickly, and ketones protect neurons, synapses, lower neuroinflammation, and prevent neurodegeneration. BHB blocks a platform responsible for inflammation called NLRP3 inflammasome[*][*]. NLRP3 unleashes inflammatory molecules that trigger neuroinflammation, cancer, insulin resistance, bone diseases, Alzheimer’s disease, skin diseases, metabolic syndrome, type 2 diabetes, and gout[*]. In one study, BHB administration decreased the inflammatory molecules IL-1β and TNF-α in the hippocampus[*]. Another study showed BHB reduced the inflammatories interleukin IL-1β and IL-18 in human white blood cells[*]. This anti-inflammatory power makes BHB useful for preventing diseases triggered or aggravated by inflammation. For example, it may help treat inflammatory skin diseases like acne, psoriasis, varicose ulcers, allergic reactions, and skin photosensitivity[*]. Takeaway: BHB blocks the activity of the complex NLRP3 inflammasome, which is responsible for major inflammation in the body. Remember that turning BHB into energy improves antioxidant protection by increasing the NAD+/NADH ratio and unlocking antioxidant genes? These protective effects are far-reaching. Its anti-inflammation powers (as explained before). Takeaway: BHB can increase lifespan by activating anti-aging genes and slashing inflammation. BHB can slow down the growth of tumors because cancer cells can’t use ketones well enough to grow and spread. Scientists exploited this weakness by taking away glucose and forcing cancer cells to depend on ketones, and it actually decreased tumors in many organs including the brain, pancreas, and colon, because the cells were unable to spread. Ketones slowed down brain tumor growth by lowering blood glucose and IGF-1 (two factors that encourage tumor progression). [*] In other words, when ketones replaced glucose as fuel, brain tumors shrank. Takeaway: Running on BHB impairs the growth of tumors. This can reverse insulin resistance — what happens when your body is forced to make extra insulin to deal with blood sugar. When you’re sensitive to insulin, you’re at a lower risk of metabolic diseases such as type 2 diabetes, non-alcoholic fatty liver disease, and obesity. Takeaway: BHB can improve insulin sensitivity and reverse insulin resistance by keeping glucose and insulin levels low. Did you know that your heart’s preferred energy source are long-chain fatty acids? Note: Using fats and using ketones are not the same thing. The heart metabolizes fat directly, without turning it into BHB first. However, just like the brain, your heart can adapt extremely well to ketones if needed. It automatically learns to regulate the breakdown of ketones, thanks to the remarkable metabolic flexibility of heart cells. BHB improves its mechanical efficiency and blood flow. Burning fatty acids increases free radicals, while BHB destroys them. Takeaway: BHB is a better fuel for the heart. It protects against oxidative damage, enhances mechanical efficiency, and improves blood flow. Your skeletal muscle also benefits from BHB, especially when exercising. Exercise increases the absorption of ketones dramatically, and in turn ketones improve performance and recovery. It’s a cycle of goodness. Endurance exercises in particular accelerate the absorption of BHB. This increased absorption triggers more fat burning. Thanks to this focus on fat, the body is able to replenish glycogen quicker after a workout, which seriously improves recovery. Takeaway: Exercises accelerates the absorption of BHB, and BHB boosts fat burning, recovery, and energy. BHB has impressive bone preserving abilities. You’ve probably heard of osteoblasts, which are cells that produce the matrix for bone formation.They create bones. Osteoclasts are the exact opposite. Their name comes from the words “osteon” (bone) and “clastos” (broken). Their job is to break down bone tissue, which is helpful in bones of healthy people, but terrible in people with osteoporosis and other bone diseases. By stopping osteoclasts, BHB reverses and possibly prevents bone break down. Takeaway: BHB prevents the growth of cells that break down bone tissue and increases bone strength and resistance. Starting a ketogenic diet is the first thing you should do if you’re serious about running on ketones. Mistakenly, the ketogenic diet is often lumped with other low carb diets, but keto is the only diet that changes your metabolism from burning sugar to burning fat. Its recommended macros of 70-80% fat, 20-25% protein, and 5-10% carbs are designed to make your body produce more BHB and AcAc so you can enter and remain in nutritional ketosis. You can expect your blood ketones to stay between 0.6 and 3.0 mmol/L. Healthy fats: Avocado, coconut oil, MCT oil, avocado oil, walnut oil, olive oil. Dairy: cream cheese, cheeses, sour cream, butter, ghee. Red meats: grass-fed beef, organs, game meat, lamb, bison, pork. White meats: pastured chicken, turkey, duck. Fish and seafood: Especially fatty fish like mackerel, sardines, and salmon. Nuts and seeds: Nut butter, macadamia nuts, cashews, walnuts, almonds, chia seeds, flaxseed. Low-starch veggies: Spinach, kale, lettuce, collard greens, zucchini, tomato. Low glycemic fruits (in small quantities if at all): blueberries, strawberries, cherries. Keto-friendly snacks: Low-carb cookies, flourless pancakes, keto frappuccino. Yes, being on keto means you’ll have to brush up on your cooking skills a little bit, but it’s not hard to cook keto meals (few ingredients!) and you’ll feel amazing afterward. Find out your personal macros with the Keto Calculator. Doing intermittent fasting will help you enter or get back into BHB-burning mode quickly. Unlike regular fasting (not eating for several days), intermittent fasting is done for just a portion of the day, and it gives you the same cognitive and longevity benefits. There are several ways to do intermittent fasting, but the most common is to eat in a limited window of time during the day and fast the remaining hours. Usually, people fast for 16 hours a day and eat in an 8-hour window. For example, you could fast from 08:00 pm to 12:00 pm, and eat from 12:00 pm to 08:00 pm. If you combine a ketogenic diet with intermittent fasting, you’ll be able to run on ketones more easily. Our food environment works hard to make us rely on sugar for energy. Carbs are hidden everywhere, in “healthy” snacks, beverages, and restaurant meals. If you’re not careful, you can surpass the small number of daily carbs you can eat on ketosis, which is around 30g. Want to know how easy it is to hit or pass your daily carb limit? A medium banana has 27g of carbs. A Nature Valley Oats ‘n Honey Crunchy Granola bar has 31g of carbs. A medium baked potato has 37g of carbs. One small buttered popcorn has 37g of carbs. If you eat too many carbs, your body will switch back to burning glucose, not BHB, and you will miss out on all the metabolic and cognitive benefits of ketones. Bummer. Sticking to real food. Avoid packaged snacks and drinks as often as possible. Always reading labels at the supermarket. Cooking at home more often. Googling what doesn’t have labels. If possible, check the nutrition facts for the places you frequent. Here are the nutritional facts of the menu from Starbucks, Red Lobster, Applebee’s, Outback Steakhouse, TGI Friday’s, Chipotle, Subway, and In-n-Out. Check more restaurants with MyFitnessPal. Avoiding fast food restaurants altogether. Raise your BHB levels wickedly fast. Save you the 12+ hours it takes your body to increase BHB levels from scratch. Help you avoid the keto flu if you’re a beginner. BHB salts are completely safe and a total game changer if you want to reap the full benefits of ketosis. When you combine a ketogenic diet, intermittent fasting, and BHB salts, running on BHB is extremely easy. We’ve been doing it for hundreds of thousands of years. It’s how our ancestors survived. Our bodies are literally born to do so. Humans in the hunter-gatherer era survived thanks to metabolic flexibility — the body’s ability to use different fuels for energy depending on the nutrients available. This adaptation was vital during a time when the source, quantity, and frequency of food was uncertain[*]. Most of the time, people were fasting, so their bodies ran on ketones, not glucose. Nowadays, most adults rely on glucose for energy thanks to the abundance of high carb foods, but we’re all born needing and using ketones. Children can produce and use BHB more efficiently than adults because, in the early days of life, ketones (BHB and AcAc) are better than glucose for brain growth and lung function. At this stage, blood ketones can reach 2–3 mmol/L (micromolar per liter), the same levels as in a ketogenic diet[*]. This ability is to burn ketones is never lost. Elderly people are able to generate ketones after a fast or a ketogenic meal at the same levels as younger adults. If we wanted, we could keep using ketones for energy throughout our adult life like we did as infants. Sadly, our food environment pushes us to ditch ketones and rely on glucose when we grow up. Unless you’re a baby, a regular keto-er, a carnivore, diabetic, or a caveman, your body runs on glucose. The good news is, it’s easy to start using ketones for fuel again. Your body is always making BHB and AcAc, but on a regular carb-based diet, the levels remain below 0.5 mmol/L (micromolar per liter), which isn’t enough to fuel your cells. Following a ketogenic diet. On low carb, high fat ketogenic diet, your body will produce consistent ketone levels above 2 mmol/L. Fasting. BHB levels rise above 0.6 mmol/L after 12–16 hours of fasting and reach 1–2 mmol/L after 2 days of fasting. Doing Intense Exercise. Doing intense exercise for 90 minutes can boost BHB to 1–2 mmol/L. In these three circumstances, your body doesn’t have access to enough carbs (glucose) or stored glucose (glycogen), so it turns to stored fat for energy. The fatty acids are metabolized by your liver into ketones (mostly BHB), which can be used by your cells as an efficient fuel source. During therapeutic treatments under the supervision of a physician, your blood BHB may rise up to 10 mmol/L. Not monitoring insulin levels as a diabetic. If insulin levels are not controlled in diabetic patients, they can drop dramatically and make your body overproduce ketone bodies above 3 mmol/L. This may provoke ketoacidosis, which can be lethal (more on that later). Entering starvation mode after extended fasts. Prolonged starvation will increase ketones to 6–8 mmol/L, but it’s not the healthiest approach. What’s the point of making lots of efficient BHB if you’re going to starve yourself and miss out on important nutrients? Remember, being in ketosis doesn’t mean you’re healthy. The best way to reap all the health benefits of BHB is to keep it in the range of nutritional ketosis. Cardiomyocytes (cardiac muscle cells). The heart is the highest ketone body consumer per unit mass[*]. Skeletal myocytes (skeletal muscle cells). Normally, your brain and muscles rely heavily on glucose, while your heart burns long-chain fatty acids, but switching to BHB can enhance their function and provide extra protection against disease. Your body can use two forms of BHB: endogenous and exogenous. Endogenous BHB is the one your body makes by itself. “Endo” comes from the Greek éndon, which means “within”. Exogenous ketones are external BHB molecules you can take as a supplement to kickstart ketosis quickly, usually in the form of BHB salts or esters. “Exo” is the opposite of “endo” and means “external”. This article will discuss both of them. Ketogenesis: The production of BHB in the liver. It means ketone (keto-) generation (-genesis). Ketolysis: The process of transforming BHB into ATP (the energy currency of the cell). It means ketone (keto-) breakdown (-lysis). Before BHB production begins, stored fat needs to be converted into free fatty acids. Lipolysis is the process of turning triglycerides — stored in fat tissue — into glycerol and free fatty acids (FFA) that enter the blood and travel to the liver to be turned into BHB. #1. Fatty acid activation (acyl-CoA): Before they’re able to cross the mitochondrial barrier, long-chain fatty acids need to be “activated” because the mitochondria only accepts short-chain fats. A molecule called Coenzyme A (CoA) is attached at the end of the fatty acid, and this combo is called acyl-CoA. Acetoacetyl-CoA: acetyl-CoA degrades into acetoacetyl-CoA. HMG-CoA: Acetoacetyl-CoA degrades into HMG-CoA. Acetoacetate (AcAc): HMG-CoA turns into the first ketone, AcAc. BHB: AcAc is reduced to BHB, and acetone is produced as a by-product. #1. Absorption by organs: When BHB is in the bloodstream, your organs — except your liver — take it up for energy. Ironically, the liver doesn’t have the ability to utilize ketones even though it makes them[*]. 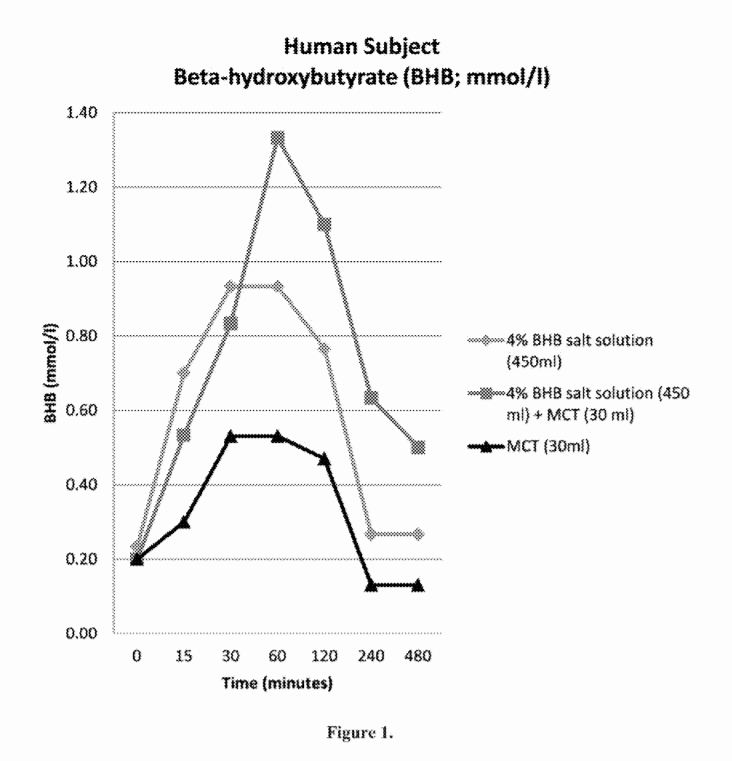 Acetoacetate (AcAc): BHB turns back into the first ketone. Acetoacetyl-CoA: Acetoacetate (AcAc) is turned back to this molecule. Acetyl-CoA: Acetoacetyl-CoA turns back to acetyl-CoA, which can enter the Krebs cycle. #3. Krebs Cycle: Acetyl-CoA completely oxidizes in the cycle, and this oxidation releases electrons into two carrier molecule: NADH or FADH2. #4. Oxidative phosphorylation (aka ATP creation): The electrons from NADH or FADH2 are transferred towards O2, which creates ATP. This is also called the mitochondrial respiratory chain. As you can see, using BHB for energy is an intricate process. Basically, acetyl-CoA can turn into BHB (in the liver), and then BHB has to turn back into acetyl-CoA to make usable energy (ATP in organs). In summary, BHB is created in the liver by oxidizing fats (ketogenesis). Then BHB is turned into ATP (energy) through oxidation in organs (ketolysis). Running on BHB gives you a metabolic advantage over glucose. Creating energy generates harmful by-products called free radicals, or oxidants. These molecules can damage cells and DNA, and they’re inevitable. During the production of ATP, the oxidants O2∙− and H2O2 are leaked. These are “tamer” free radicals that can be easily countered with antioxidants. Therefore, it’s necessary to minimize free radicals during energy production and optimize antioxidants. The fuel your body uses and the resources they consume to create ATP influences how many free radicals are created and suppressed. The fewer free radicals a fuel creates, the more efficient it is. Glucose goes through a slightly longer process than BHB before entering the Krebs cycle. Through glycolysis, glucose turns into pyruvate, and then pyruvate is turned into acetyl-CoA, which can enter the Krebs cycle. This path from glucose > pyruvate > acetyl-CoA eats up significant resources. One glucose molecule consumes 4 NAD+ molecules, which turn into 4 NADH. In other words, the ratio of NAD+/ NADH should stay high. Low NAD+ causes serious oxidative damage. Because glucose consumes 4 NAD+ molecules from the get-go, it tips the scale towards more NADH, which can cause more oxidative damage. BHB skips glycolysis. It only has to convert back to AcAc and then to acetyl-CoA before entering the Krebs cycle, a process that uses up half the resources as glucose. One BHB molecule consumes only 2 NAD+ molecules, which turn into 2 NADH. This means BHB is more efficient than glucose and protects the NAD+/NADH ratio. Using BHB for fuel is more efficient than using glucose because it consumes less NAD+ molecules, increasing the NAD+/NADH ratio, which prevents oxidative damage and promotes longevity. It also fights the damage of inevitable free radicals by activating powerful antioxidants, which glucose doesn’t do. Each molecule of glucose and BHB creates different amounts of ATP, which carries usable energy to your cells. When ATP releases this energy inside your cells, it’s called ATP hydrolysis. The amount of energy released can be measured in kilocalories, through an equation called the change in Gibbs free energy (ΔG). In this context, ΔG represents the kilocalories released by each individual molecule of ATP. This means each molecule of ATP generates about 7.3 kilocalories. 34 ATP*7.3 kilocalories = 248 kilocalories. One molecule of BHB makes around 21.5 molecules of ATP. [*] This is less than glucose, but remember it’s more efficient and creates fewer free radicals in the process. This means each ATP molecule generates 13 kilocalories, almost double than ATP from glucose. 21.5 ATP*13 kilocalories = 279 kilocalories. Glucose yields more ATP molecules, but the total energy released by each ATP is lower than BHB. BHB creates fewer ATP molecules, but it’s cleaner and releases more total energy per ATP molecule. In the end, BHB can make just as much, or even more energy than glucose in a cleaner way. There are two ways to get exogenous ketones in the market: BHB salts and ketone esters. When you take BHB salts, they’re broken down during digestion and release free BHB into your bloodstream. BHB then travels toward your organs, where it starts ketolysis to create energy. Basically, you enjoy the perks of BHB right away without having to wait for your body to raise ketone levels. Don’t be afraid of salts like sodium. While it’s true excess sodium is harmful, people on a ketogenic diet can benefit from consuming more mineral salts because ketones make you lose more electrolytes in your urine. It’s recommended that keto-ers add more electrolytes to their food, such as sodium, calcium, potassium, and magnesium. BHB salts can help with that supplementation. Perfect Keto Exogenous Ketones are based on calcium, sodium, and magnesium. This is at least 85% faster than the usual 12+ hours it takes your body to start raising ketone levels on its own. In addition, the peak in BHB levels lasts almost 2 hours. This accelerated ketone production saves you from the dreaded keto flu. When people switch to a ketogenic diet for the first time, they may experience symptoms similar to the flu, including brain fog, irritability, nausea, cravings, stomach aches, and sore muscles. This happens because your body has to adjust to burning fatty acids, and it takes time. The severity of the symptoms varies from person to person. With BHB salts, you can skip the side effects of this adaptation because you enter ketosis almost immediately. One 4-week study found supplementing with BHB salts (of sodium and potassium) kept glucose low for 12 hours, in the range of 80-100 mg/dL. People with a low blood sugar tend to be more insulin sensitive, which prevents insulin resistance and the metabolic diseases that stem from it (obesity, type I diabetes, metabolic syndrome). Taking BHB salts may decrease abdominal fat and accelerate the fat loss rate during workouts. This fat loss is no surprise considering endogenous BHB also pushes your body to burn more fat for fuel. New research finds that supplementing with ketone salts decreases anxiety-related behavior in rats. There’s no doubt exogenous BHB allows you to tweak your metabolism in a way you couldn’t do just a few years ago. It basically lets you enter ketosis on command. Still, there’s one more thing you can do to make BHB salts more effective: Add MCT oil. Studies find that supplementing with a mix of BHB salts and MCTs skyrockets BHB production. Taking BHB salts with MCTs raises blood BHB higher than salts or MCTs alone. This graph, taken from a patent by the keto experts and researchers Dominic Paul D’Agostino, Patrick Arnold, and Shannon Kesl, shows that supplementing with a mix of BHB salts and MCTs drove blood BHB to a maximum of 1.33 mmol/L in just one hour. In contrast, BHB salts alone increased BHB to a maximum of 0.93 mmol/L, while MCTs increased it to a maximum of 0.53 mmol/L in a similar timeframe. So, if you want to run on BHB, you can get there effortlessly by adding some MCTs to your exogenous ketones– how easy is that? A great way to combine the two is in your morning coffee or in fat bombs like Perfect Keto Mocha Fat Bombs. There’s one more thing you can do to amplify the benefits of BHB salts: Fasting. Short answer: yes and it can accelerate ketosis. When you fast, your body starts to make BHB on its own, so taking exogenous ketones won’t put you out of fasting mode. They simply add to the BHB already in your body, which puts you in ketosis a lot quicker. If you fast to enter ketosis, BHB salts will give you a serious boost. If you fast only for longevity or weight loss benefits, BHB salts are harmless. Because exogenous ketone salts are a novel supplement, the quality and composition vary drastically across brands. That’s why you must learn to spot high-quality BHB. A high-quality supplement maximizes the exogenous BHB and adds only the amount of mineral salts that is absolutely necessary. The most popular mineral salts used in the market are: sodium, potassium, magnesium, and calcium, and most supplements use three of them, although some still use only two. Check the label and make sure the quantity of each mineral salt is below 1g. A BHB salt blend rarely needs more than 1g per mineral to be effective. For example, the 3 minerals salts used in Perfect Keto Exogenous Ketones provide less than one gram each (0.68g sodium, 0.59g calcium, and 0.32g magnesium). Next, look for a proportionate balance of mineral salts. You don’t want one mineral doing all the heavy lifting. For example, if a product has 0.3g magnesium, 0.5g calcium, and 0.6g sodium, the salts are well distributed. If a product has 0.95g of sodium and 0.2g of magnesium, it’s unbalanced and not the best choice. Fillers and texture enhancers like guar gum, xanthan gum, and silica (also named silicon dioxide) are common in commercial exogenous ketone salts, and also completely unnecessary. To get the purest BHB salts, simply look for the part of the nutritional label that says “other ingredients” and get the product with the shortest list. For instance, Perfect Keto Exogenous Ketones in the Coffee flavor, only have 3 extra ingredients: stevia, citric acid, and ground coffee powder. Flavored BHB salts are a delicious way to boost ketones, but manufacturers can cut corners by adding high carb sweeteners and artificial flavors. Look for a blend flavored with real ingredients (avoid artificial flavors) and sweetened with natural zero-carb sweeteners like stevia or monk fruit. Perfecto Keto Exogenous Ketones come in 4 flavors: Chocolate Sea Salt, Peaches and Cream, Coffee, and Vanilla — and none of them have artificial flavors or high carb sweeteners. Paired with MCT Oil Powder for that extra BHB boost. Smoothies. Try this Chocolate Sea Salt Smoothie. Hot coffee. Chocolate Sea Salt and Coffee BHB salts are a good match. Popsicles. Peaches and Cream or Vanilla BHB salts are a perfect fit. If you’re just starting out, urine strips help you track your BHB levels easily. When you’re a more experienced keto-er and want to be extremely precise, move on to testing the ketone levels in your blood. The Precision Xtra meter is one of the highest quality meters out there. You’ll have to prick your finger each time, but you’ll get the most accurate results. It’s not dangerous to supplement with BHB salts as long as your blood BHB remains at a level of nutritional ketosis (0.6-3 mmol/L). As always, consult with your doctor before taking a new supplement. Diabetic people may benefit from being on a ketogenic diet and taking exogenous ketones because BHB lowers blood sugar and improves insulin sensitivity. However, diabetics are at higher risk of developing diabetic ketoacidosis, which is an overproduction of BHB to toxic levels. Diabetic ketoacidosis happens when blood ketones go above 3 mmol/L thanks to dangerously low levels of insulin. Usually, the body tries to fight this by producing excessive amounts of glucose (higher than 200 mg/dL), but the cells are unable to process it due to lack of insulin. Diabetic ketoacidosis can be lethal. Some of the symptoms include: nausea, vomiting, abdominal pain, fatigue, confusion, and shortness of breath. Ketoacidosis happens mostly to diabetic patients, though, so if you’re non-diabetic your chances of getting it are extremely low. If you have diabetes, only try a new diet and new supplements under the supervision of your physician. There’s a second form of BHB toxicity called alcoholic ketoacidosis, which is even less common than diabetic ketoacidosis. This happens when excessive alcohol consumption leads to depleted glucose stores and high ketone levels. Ethanol blocks your ability to use glucose, reduces insulin levels, and stimulates the breakdown of fats, leading to more ketones than you can handle. This is easily avoidable by not drinking on an empty stomach and avoiding excessive drinking. The ketogenic diet doesn’t imbalance women’s hormones, so exogenous BHB is unlikely to do it either. However, if you have pre-existing hormone imbalance such as hyperthyroidism or PCOS, you should consult with your doctor before embarking on the ketogenic diet or taking any BHB supplements to make sure they don’t worsen your condition. For pregnant women, a ketogenic diet isn’t dangerous and ketosis often occurs naturally. With that said, there is just not enough data yet about the safety of taking exogenous ketones during pregnancy. Always consult with your doctor before taking a new supplement while pregnant. Children can also benefit from a ketogenic diet. In fact, infants use ketones in their early days of life, so it’s not unsafe for the little ones to run on BHB from time to time. However, there’s not enough evidence about the safety of BHB salts in children. All the current studies on the topic have been made on adults. If you want your child to enjoy some of the benefits of keto, stick to kid-friendly keto recipes. BHB is far more efficient than glucose. Not only does it provide as much or even more energy, but it does so while fighting oxidative damage, lowering inflammation, and improving the function of your organs. If you want to burn more fat, increase cognitive function, and extend your lifespan, running on BHB is the way to go. You can optimize your BHB production by following a ketogenic diet, fasting, avoiding hidden carbs, and taking exogenous ketones and MCT oil. Exogenous ketones in the form of BHB salts boost your blood BHB in just an hour, so you don’t have to wait the 12+ hours it takes your body to completely switch between fuels. If you’ve been relying on carbs for energy — as most people do — but don’t feel your best, running on BHB can be just what your brain and metabolism need.